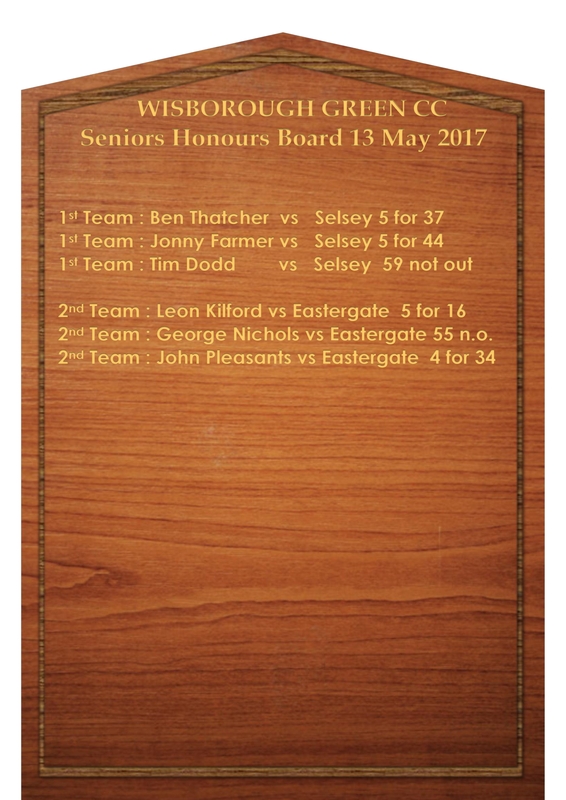 We are delighted to announce that we will be publishing an honours boards for the Colts and Seniors every week commencing this week. The idea is to recognise noteworthy personal achievements for the week – be they performances that made real differences to their respective teams, or other personal milestones that are noteworthy in their own right – be it someone taking a wicket for the very first time , taking an outstanding catch or hitting a four. There are most certainly a number of achievements to celebrate this week – well done to the players who have made it onto the board this week. We are looking at increasing the number of players to acknowledge in the forthcoming weeks. As you may know the club spend many thousands of pounds building the new nets last season and we are very keen to try and preserve them as much as possible. We would appreciate it very much if children could refrain from playing football in the nets and riding their bicycles across the surface which could easily cause damage. Cricketing activities are of course very welcome in the nets area. We are looking to create a lost property box upstairs in the Pav. If you find any lost property , please put it in the lost property box. Click here to see the provisional first and second team selections for this week. A less than triumphant picture of Jonny taken later in the evening was unavailable for publication …..
Next match : 11 June. Good luck with the exams lads ! Green were looking to banish the memory of an opening day defeat by putting together a good performance at Selsey. The team made the long journey down to the coast and, on arrival, found a wicket with a bit of moisture in that might do a bit if the bowlers put the ball in the right areas. Captain Sadler won the toss and asked Selsey to have a bat. Farmer and Thatcher started well with the ball and Selsey struggled to get the ball away. The two beat the bat with regularity and kept the scoring rate to under 2 an over. They had to stay patient though and the first wicket didn’t arrive until about the 10th over. Thatcher struck twice having opener James Amis caught and then 3 balls later Tom Amis was LBW. Selsey were 17 for 2 but recovered somewhat and the score moved along to 42 before Farmer got into the act. He finally got some luck from sticking to his task and removed the dangerous Fewster and 2 overs later got his second wicket thanks to an excellent catch at cover by DJ. Thatchers 3rd wicket made the score 467 for 5 in the next over and now Green were well on top. Farmer took the next wicket soon after and both bowlers now had 3 apiece. The race was on to see who could get to 5 first. Both went into their 15th and last overs still on 3 wickets. Farmer was first up and started by bowling Will Smith for wicket number 4. By this time Farmer was really “Getting Jiggy With It” and with the last ball of his spell got the 5th wicket that it seemed like he’d been “Chasing Forever”. He felt like a real “Fresh Prince”. Determined not to be outdone Thatcher set out to equal Farmers achievements in his last over. The first thing to do was to get the dangerous Farhat Bhutta who had come in and set about trying to ruin Thatchers figures with some lusty blows down the ground. Fortunately he took a single with his first ball which allowed Thatcher to bowl at Selseys number 10. He only needed one ball. He clean bowled the 10 and the last Selsey man was out 3 balls later. Thatcher finished with 5 for 37 and Farmer with 5 for 44. Selsey 84 all out. Tea was taken and the visitors set about trying to win the game with as little fuss as possible. Chairman Calder-Smith was asked to try and anchor the innings and Doddy was employed at the other end to try and smash Wis to victory. The plan worked well as the pair added 66 for the first wicket. Both doing exactly what was asked. Doddy powered his way to an unbeaten 59 which included 9 fours and 3 sixes meaning only 5 of his runs were actually run! Just the way he likes it! So the game was won and maximum points were taken! A good day all round. 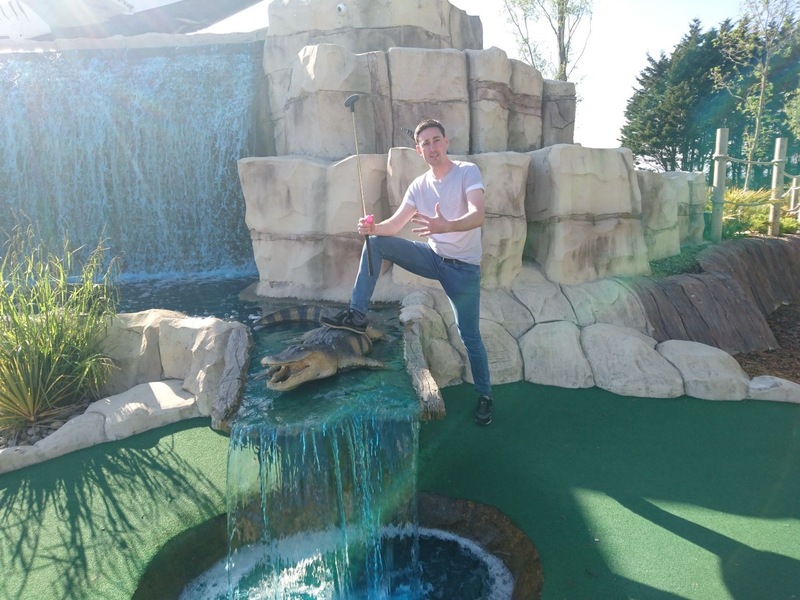 Some of the lads even stopped off for some crazy golf on the way home. A shame no one can remember who won that. Skippers comments: Great performance by Thatcher & Farmer bowling with control which allows me to put the batsmen under pressure with some aggressive field settings. Great hitting from Dodd! WG won the toss and elected to field – a good decision with a slightly damp wicket and proven run chasing capability. 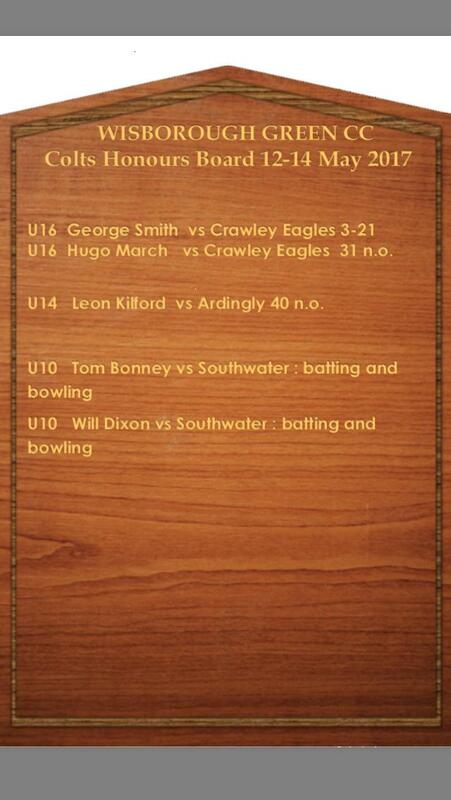 Luca and Leon opened the bowling well with good accuracy and length limiting Eastergate’s run scoring opportunities. Leon picked up 2 well deserved wickets in his first spell with impressive movement off the seam. After youth had shown the way including a short spell from Josh, it was time for the more mature members of the team to shine with the ball and they did not disappoint. Nick and JP bowled consistently straight and at a good length not only stemming runs but also picking up wickets with JP ending up with an excellent 4 for 24 including the opportunity for a hattrick ball and Nick 1 for 33 both from 9 overs. Often after about 25-30 overs have been bowled there is a lull in the field where opportunities are squandered and the quality of the fielding deteriorated however the WG team managed to avoid this and worked hard till the end. The Eastergate tail was comprehensively dismissed during an outstanding second spell from Leon who ended up with the excellent figures of 5 for 16 , with the opposition ending on 158 after 37 overs. A solid fielding effort with all contributing positively and a particularly noteworthy performance behind the stumps from Callum who glided effortlessly to cover the occasional stray legside delivery. Many thanks to JP and Lena for preparing a tea fit for kings – hot food including an amazing steak and potato pie set a new standard for WG match teas. At 4-an-over needed for victory there was no need for WG to panic – all that was needed was for the top order batsmen to stay in and hit the inevitable bad ball. This is normally easier said than done. The first over went well with 10 runs coming from it however soon afterwards the two openers were back in the pavilion licking their wounds. George and Nick were looking good until Nick played a drive too early and scooped up a catch to the bowler. George continued as the anchor man whilst Callum and then Leon played sensibly but succumbed to good bowling. George then developed useful partnerships with Dan and then Luca scoring a well-earned 55 before falling victim himself. At 91 for 6 after 27 overs the match looked poised for an exciting finale. Eastergate then turned the screw with some accurate bowling forcing Luca and JP to chase the runs. Wisborough Green finished short on 122 all out after 37 overs – a valiant effort from everyone.